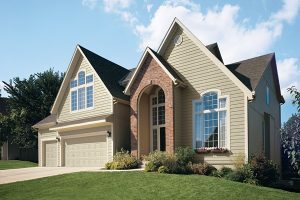 Krech Exteriors is your local source for advanced engineered LP siding in St. Paul and Minneapolis, offering both cedar shake and lap styles, as well as panel siding. LP’s advanced engineered wood siding offers the timeless beauty of wood grain, with a durability and workability that is unmatched by traditional wood siding. LP SmartSide is quickly becoming a leading choice for home remodelers and homeowners throughout the country. LP SmartSide offers a number of advantages over wood, vinyl, or fiber cement siding. Tested against extreme climate conditions, LP siding will stand up to nearly anything our Minnesota climate can throw at it. LP’s advanced zinc-borate based treatment and weather resistant wax coating has been proven to resist rot, decay, and termites, all factors that will compromise traditional wood siding. With SmartSide, your home will have the beautiful appearance of wood grain siding without the constant maintenance. The advanced nature of LP’s engineered wood material allows for easy customizations, giving you a wide range of style options. When you turn to Krech Exteriors for LP siding, our experienced design team will work with you to choose the style and finish that best suits your home. Lightweight and easy to install, SmartSide siding is an installer’s dream. When you turn to a fully certified LP siding installation specialist like Krech Exteriors, your new siding will be installed in a matter of hours. And since SmartSide siding is produced in up to 16 ft. sections, as opposed to the traditional 12 ft., SmartSide offers a more fluid exterior appearance with fewer seams.